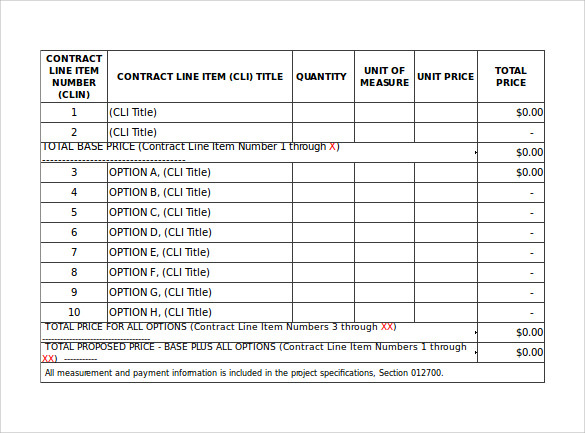 Sample Payment Schedule Template is a signed contractual obligation executed by the payer to the payee that he will make the payment on the pre-defined dates. The payer is obliged to make the payment on or before the scheduled date failing which he will be penalized severely as per the governing laws. 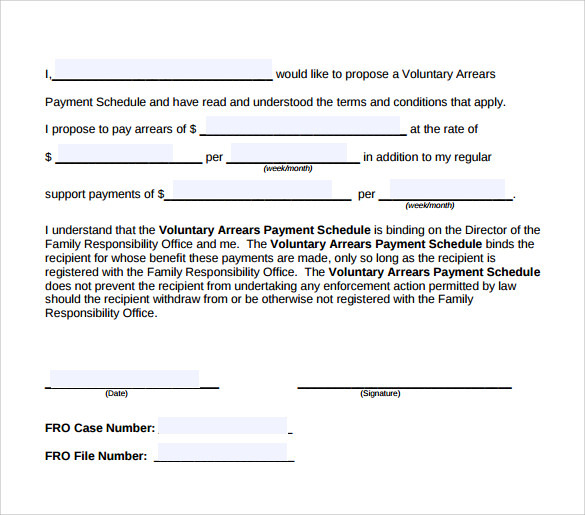 This document may be executed in stamped paper or general application form at the time of signing the contract. The payer cannot escape from payment when he enters into legal binding. 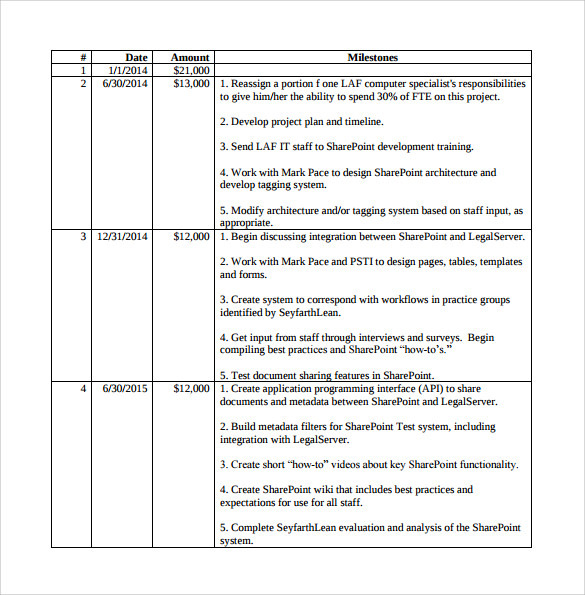 Payment Work Schedule Templates is nothing but authorization from the payer that he will be making prompt payment every month failing which he will face necessary actions.Sample Payment Schedule Template is attached with this document. 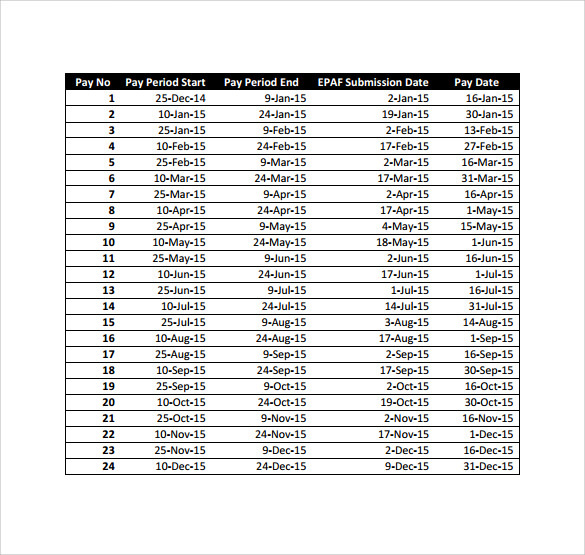 This example template serves to record the pay dates, pay periods and payment did date for each payable employee. It is available in a 1-page PDF file. 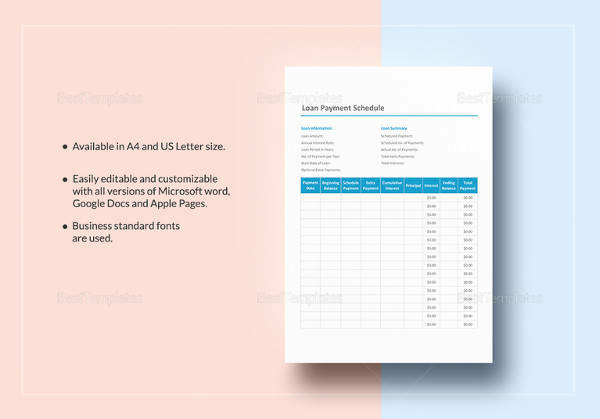 This template helps keep track in a simple manner of each payment to be done which further helps to calculate how much the person should be paid. This template is predominantly applicable for people who work under a research grant commission. There are columns dedicated to writing the serial number, date, amount sanctioned, milestones achieved. Under each milestones slot, the achievements need to be noted down before the next payment slot. 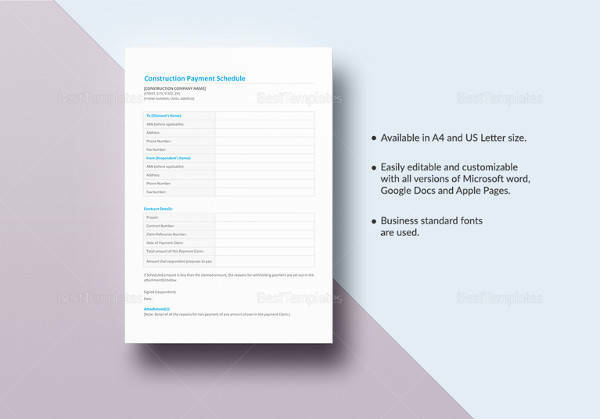 This template is a payment application form circulated and distributed by the Human Resources department of a company. 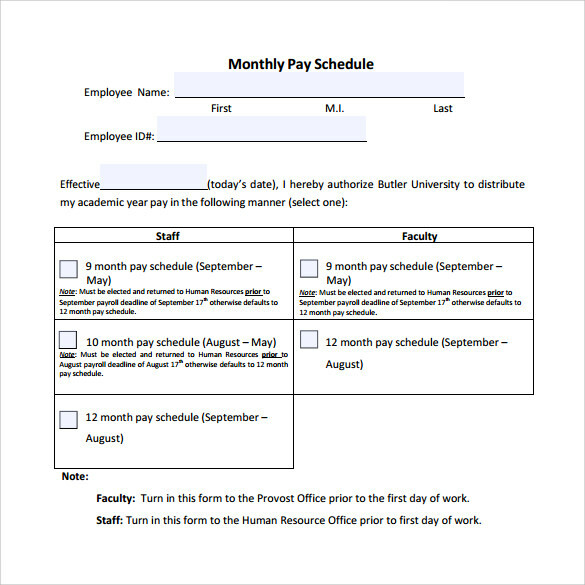 The faculty and staff members are asked to write down their names and department to which they belong and acknowledge the pay package they want. Why You need Sample Payment Schedule Templates? With numerous jobs building up on a regular basis in several departments, keeping a check on who gets paid how much and by when becomes somewhat aggravating. With your busy corporate life, remembering these tedious things becomes painfully taxing to the already strained mind. However, the payments need to be done on time or there will be several issues and discords among the staff members and management heads. 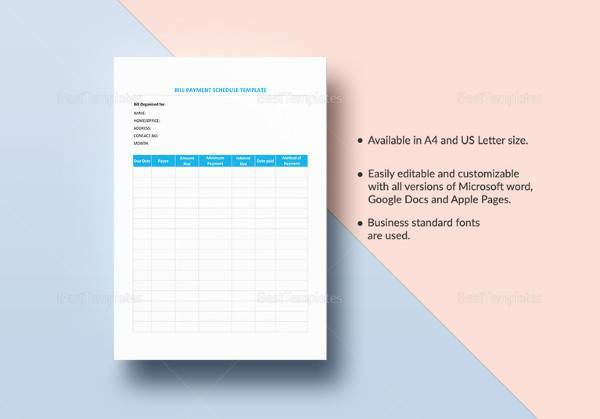 These templates keep an eye on your payments and can also be used as an official record to tackle the income tax department or so. This template can be used for legal purposes too. 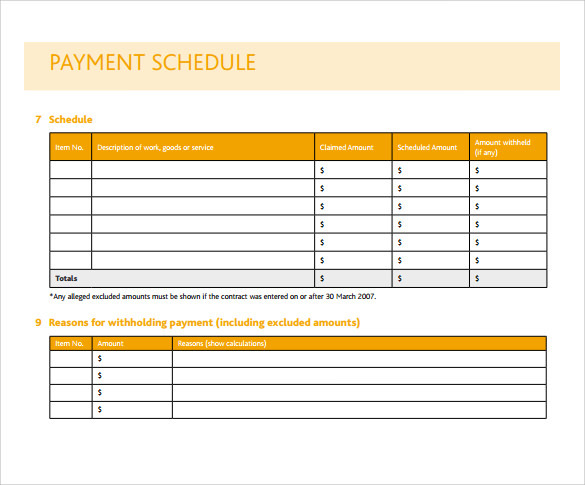 When You Need Sample Payment Schedule Templates? 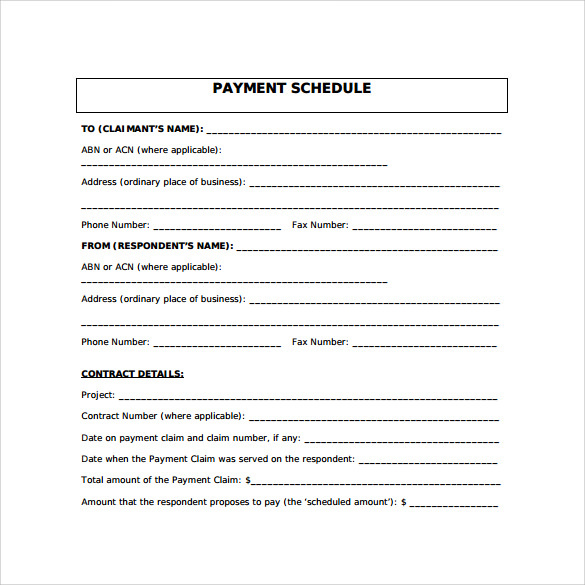 You can need and use Sample Payment Schedule Templates anytime you are responsible for payments. 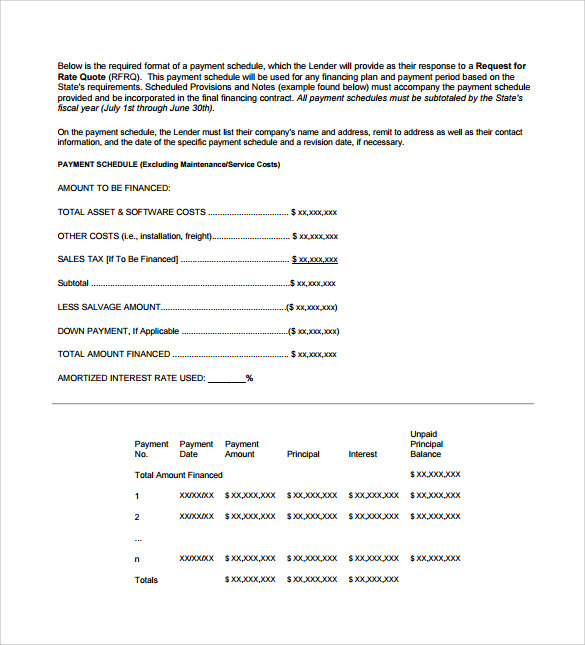 This template can be used by the payer or employer who forms a contract when the payee or employee signs the agreement too. 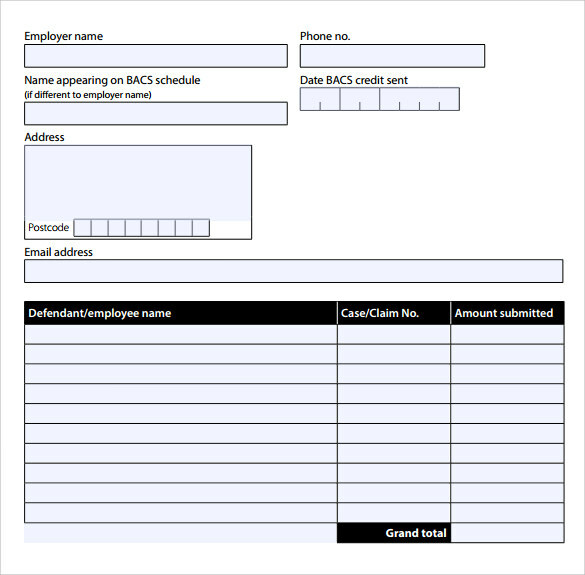 These templates basically can be used by any employer who gets bound by legal contractility to be payable to the services provided by the employee to the institution or organization s/he is currently employed in. You can use these templates whenever you want to be provided you have a team of workers under who need to be paid on a time. 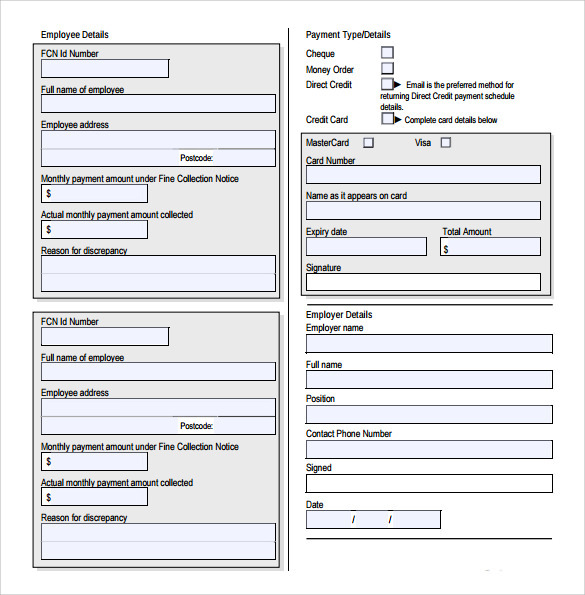 There are many benefits of using sample payment schedule templates. First of all, it has clean designs and easily legitimatized and understood. The language used is quite simple and if anyone so desires, they can legalize the document too. Second of all, these templates are free to download. 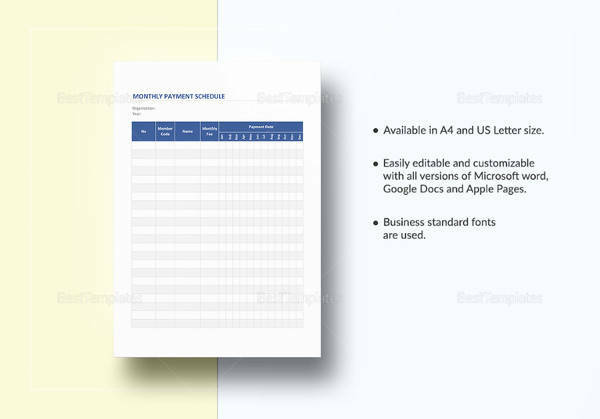 You can absolutely download these sample payment schedule templates without any payment hassles. Third of all, they are east to edit and customize. Fourth, you can easily print these and also operate and access them in PDF readers which are available across all platforms and devices around the world. 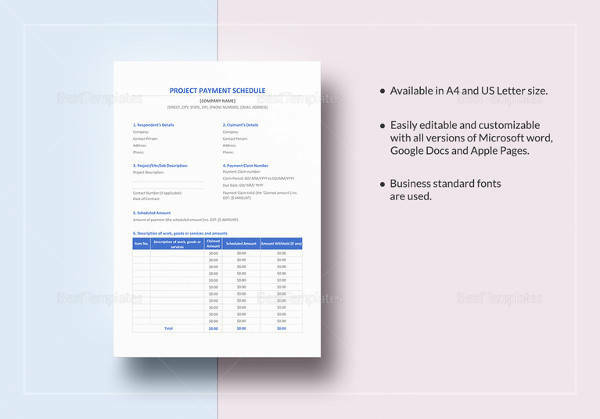 Sample payment schedule templates make life easier and more organized for corporate businessmen. 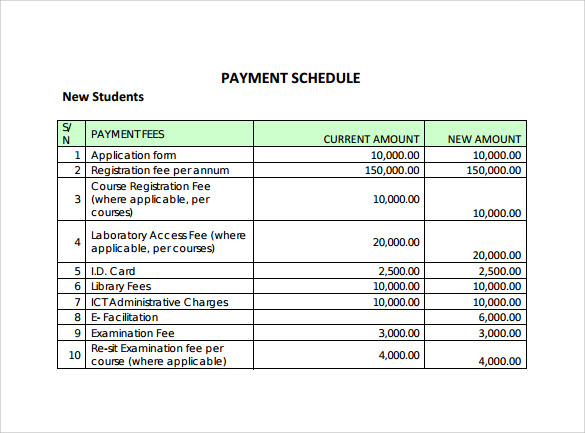 You can select any of the templates from our assorted collection of sample payment schedule templates. We offer them in PDF and Excel format which make it easier for you to access and operate.